Time was when cooking was something most children partook in on a regular basis, as family tradition dictated passing down treasured recipes from generation to generation. But with the popularity of video games, computers and Gameboys, simple cooking lessons seem to have become just a neglected and forgotten memory of the past. And the availability of ready-meals doesn't help. Despite the convenience of fast food, in today's society both boys and girls should know how to cook for themselves. There's no better time to start than when they're old enough to take something out of the oven on their own. Most youngsters between the ages of eight and 12 enjoy helping prepare meals, and if they get good at it, before too long you might have them making you dinner on a regular basis! Discuss basic hygiene issues first, such as hand-washing and the importance of clean cloths, work surfaces and sponges. Then bring up food safety: why some foods should stay hot and others cold, cooking food carefully, why some tasks require adult supervision. Talk about ingredients. Tell them about baking soda, yeast, the differences between different types of sugar. Especially important if you had a budding baker on your hands. Teach them how to use kitchen machines properly, such as the microwave, oven, blender. If you have a younger child, stress that knowing how things work doesn't mean they can do it on their own. Show them how to follow a recipe, how to measure, and what simple measuring techniques are. Most children will have already learned the basics in school – it's all simple maths! Don't rush it. Obviously, it can take twice as much time to bake a cake with a child helping than it does on your own, and following a recipe can be a nightmare for an eight-year-old. Be patient and offer plenty of praise and encouragement. Stress the importance of cleaning up – and make them do it! Start by discussing potential dishes your child might like to make. Pizza – yes, liver and onions – no. It's no use trying to interest a child in something they find revolting. Have them practice by making several individual dishes with you over a course of days or week, working up to an entire meal. They can start by doing simple tasks such as measuring food, then work up to more complicated ones such as chopping and cutting. Remember, while an eight-year-old might not have the manual dexterity or maturity to use an electric hand mixer, many 12-year-olds are capable of that – and much more. Decide on a menu. Starters, main dish, side dishes and pudding. Make a shopping list. That means checking the kitchen larder to see what staples are there (salt, cooking oil, flour) and what needs to be bought. Accompany parent to shop and purchase groceries – then put them away at home. Cook – including dicing, slicing and all other preparation. This means learning not only how to prepare food, but to plan the timing etc so everything is ready at one time. Setting table, getting family to table, serving food. Clean up! Not just loading the dishwasher, but washing all the saucepans, sweeping floor if needed and taking out rubbish. Not every child harbours ambitions to become a celebrity chef, but we all should learn how to cook basic, nutritious meals for ourselves and our families. Encouraging kids to cook from an early age and piling on the praise when they try are both important, as is enough patience to withstand recipe disasters and huge messes. 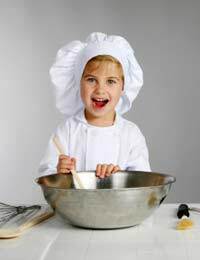 Who knows, your junior chef might turn out to be the next Aldo Zilli or Gordon Ramsey!